The traditional-style En Plo Boutique Suites is just 15 meters from the beach and offers an outdoor pool with sun terrace and a well-kept garden. In addition, it is within walking distance of the picturesque town of Oia. Please inform En Plo Boutique Suites in advance of your expected arrival time. For this, you can use the special requests section when making the reservation or contact the accommodation directly. The contact details appear on the booking confirmation. The hotel can arrange a shuttle service to the port or airport for an additional fee. If you wish to use this service, you must contact the establishment with at least 24 hours in advance. Breakfast is served every morning at the 08: 30. The Veggera is a complex of 4 stars with 3 pools and hot tub located on the seafront, on the beach of Perissa, the most famous of Santorini. Guests must show a valid ID and credit card upon check-in. Please note that all special requests are subject to availability and may incur additional charges. Guests wishing to use the airport shuttle service must inform the Veggera with 5 days in advance. For security reasons and to validate the reservation, it is necessary to provide the credit card information and present it upon check-in for verification. 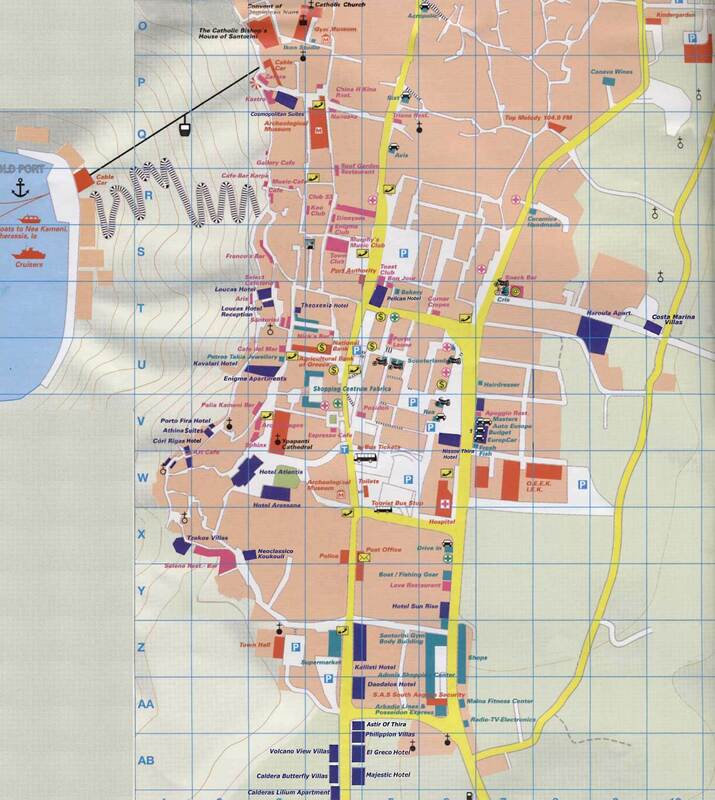 If you are preparing a trip to the island of Santorini on your own Surely you will need several maps on the island. Next you will be able to find several maps that will come to you very well: one general on one's own Santorini island, Another tourist map about Oia (Ia) and two maps of Fira (Thira), one tourist and another bird's eye view. Do not worry too much about taking the maps from here since in almost all hotels you can give these maps but if someone wants them in advance, you can have them. What you see here on each map is a small portion, click on each image or on the link enabled in each one of them to be able to open the map in large size and thus be able to download and print it. Here you can find a complete map of the island of Santorini perfect to print where you will find all the main points of interest as well as the beaches and villages and cities. It also includes the main roads as well as the location of airport and the main ones harbors of the island of Santorini. Travel Fira the first time you visit it can be a little crazy if you do not have a beforehand map that allows you to continue the journey. There are some indications inside the city of Fira but they are insufficient if you do not have anything to guide you, therefore, a map with directions of the streets It will be great for you. Oia is a small town that without a map it is well traveled although as always it is not bad to have one in case we end up in some dead end street. He town is very linear and perhaps the greatest difficulty is finding the way to the port of Amoudi, otherwise, it is difficult to get lost even if we do not carry anything to guide us. If it happens to you that you do not clarify with the tourist map of Fira (Thira) previous, here you have another Fira map (Thira) in 3 dimensions from which you can see Fira from an aerial view. 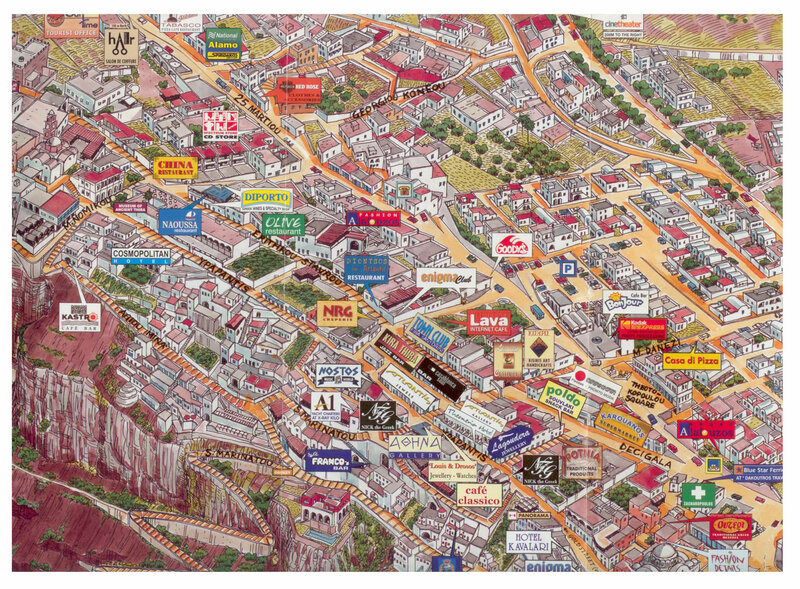 The good thing about this map is that you indicates some of the stores and businesses of the city making it easier to locate.